These two orange fairy shrimp are swimming in a sample of water taken from a vernal pool in Westborough in March 2007 and later returned to the pool. They are less than an inch long and are greatly enlarged in the photo. What’s that? A gourmet dish at a trendy Asian restaurant? Schoolyard name-calling? A title for child’s fanciful crayon drawing posted on the refrigerator? Fairy shrimp (Eubranchipus) are small creatures that live in vernal pools – those landlocked woodland pools that are full of water in the spring but dry up and disappear by late summer in most years. Fairy shrimp spend their entire lives in vernal pools. They need vernal pools – it’s where they live. And they don’t live anywhere else. Their name comes from the way fairy shrimp appear suddenly – like magic, as if fairies were at work – when the dried-up pools fill with water in the spring. We have fairy shrimp right here in Westborough. How can you tell? If you venture into the woods after the snow and ice melt and find a vernal pool in a dip or depression, look into the water. Does it have a brown-orange tinge to it, a color very much like the fallen leaves on the ground surrounding it? If so, that’s probably because the vernal pool is teeming with young fairy shrimp. So many of these tiny bronze-colored creatures are swimming around that they lend their color to the water. Massachusetts has three kinds of fairy shrimp, but almost all are vernal fairy shrimp (Eubranchipus vernalis). One of the others, the intricate fairly shrimp (E. intricatus), is rare enough to be protected as a “species of special concern” in Massachusetts. Our fairy shrimp are tiny, measuring about an inch. They’re crustaceans, like water fleas, lobsters, crayfish, crabs, and the shrimp we’re used to eating. Like them, fairy shrimp have a crusty skeleton on the outside of their bodies, protecting their delicate insides. They have to molt, or shed their skeleton, several times as they grow. As they swim, fairy shrimp look around with two eyes on stalks, and they eat – by filtering bacteria, algae, and other small animals from the water. Their main meal is algae, which starts growing early in vernal pools, thanks to sunlight that arrives before the nearby trees leaf out. Considering that vernal pools do a disappearing act each summer, fairy shrimp have a tough place to call home. What’s the advantage of living in water that vanishes? For one, vernal pools don’t have fish, so that’s one major predator that’s not around to gobble up fairy shrimp. Yet vernal pools do have predators that feast on fairly shrimp, especially as spring progresses and eggs of wood frogs and salamanders hatch hungry tadpoles and young. The adult frogs and salamanders come to vernal pools to breed because of the same advantage – no fish to eat their eggs and young. When you count other predators, such as beetle larvae, vernal pools look like a dangerous place to call home. This is where appearing-like-magic comes in. This trick gives the fairy shrimp a head start on most predators. They live out their lives in the early weeks after the vernal pool thaws, before too many predators have hatched. How can fairy shrimp appear so early? They hatch from eggs that are already there. These eggs were dropped on the bottom of the pool in past years. Quite a supply of fairy shrimp eggs builds up, creating an “egg bank” that lasts many years. The fairy shrimp that hatch each year may come from eggs left in the pool in several different years. But how do those eggs survive a pool that dries out? They have to get through the heat and drought of summer and winter’s deep-freeze. And some eggs do so more than once. To get the general idea (without scientific details), think of a recently laid bird’s egg, complete with a chick beginning to develop inside. Imagine that it could be dried, baked, and then frozen. Sounds like a good way to kill an egg, right? Then imagine that after soaking in cold water, it would go on to hatch a perfectly good chick! That, in a way, is what happens with fairy shrimp eggs. But even more remarkably, our local fairy shrimp eggs need these drastic events – drying, freezing, flooding – before they can hatch. In short, they need vernal pools. Without those harsh vernal pool conditions, no fairy shrimp! How do fairy shrimp eggs do it? The egg is basically an embryo protected from its environment by a hard shell. Through summer, fall, and winter, it develops in stages that are tied to seasonal conditions in the environment, such as temperature, moisture, oxygen (in air or water), and perhaps even daylight. Under certain harsh conditions, the egg goes dormant. Its chemical and life processes shut down in an orderly way that makes it possible for them to start up again in an equally orderly way as conditions improve. That’s not something that humans, or birds’ eggs, can do. Harsh conditions can be helpful. When eggs go dormant to survive freezing, they also avoid hatching too soon. That might happen, for example, in a pool that filled up in late fall. Unlike grown fairy shrimp, dormant eggs sometimes travel. Wind might blow eggs to a nearby vernal pool, or eggs might hitchhike on a duck or turtle. Eggs have even been known to survive digestive processes in a duck. Once they hatch in the spring, fairy shrimp mature quickly. After a couple of weeks, males and females are ready to mate. Females carry eggs in special brood pouches before dropping them on the bottom of the pool. 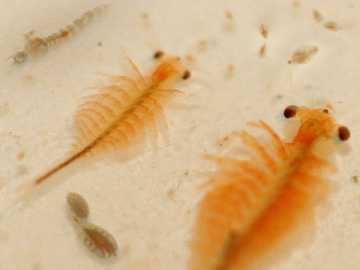 Fairy shrimp die when the water warms in May, but they produce several batches of eggs before then. Vernal pools – home to fairy shrimp – are special environments, but they are also one of our most threatened wetlands. In order to be protected under the Massachusetts Wetlands Protection Act, a vernal pool must be certified, or registered with the Mass Natural Heritage and Endangered Species program. Westborough currently has 42 certified vernal pools and 139 potential vernal pools. Most of these certified vernal pools are on public land or Westborough Community Land Trust property, but vernal pools on private land can also be certified, with permission of the landowner. Wheaton College professors and the Wheaton College Vernal Pool Research Team regularly do research on Westborough vernal pools.